Step out of New Street’s hustle and into the shadows of an adjacent service yard; here lie a couple of forgotten stage doors that once served the Odeon Cinema during its role as one of Birmingham’s prime music venues. Today, as the noon day winter sun filters through, it is still possible to imagine the heady atmosphere of fans congregating and waiting for their idols…cigarette smoke curling into the cold night air… the heady scent of alcohol, perfume and aftershave exchanged over raucous conversation. Here you will find a number of brick walls that bear testament to the music fans that waited for their idols. 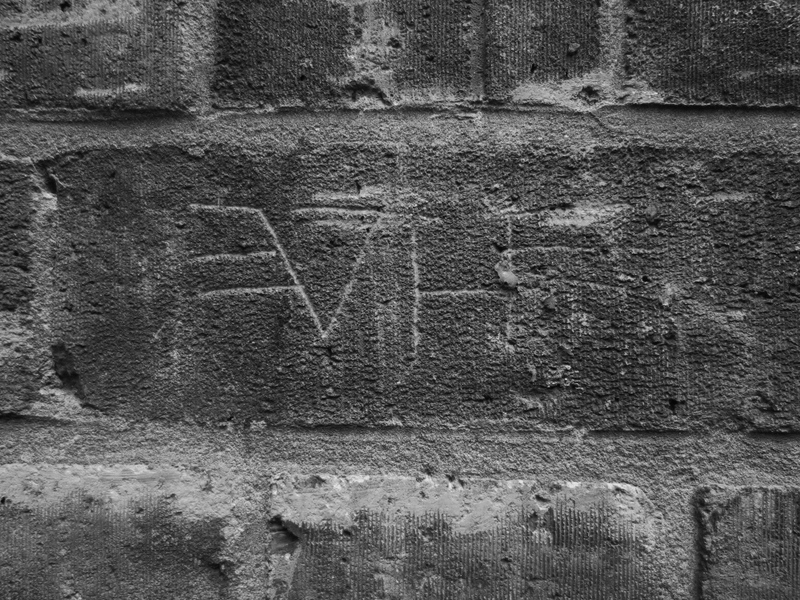 Over thirty years on, the graffiti marks made on the walls by those waiting, still remain. 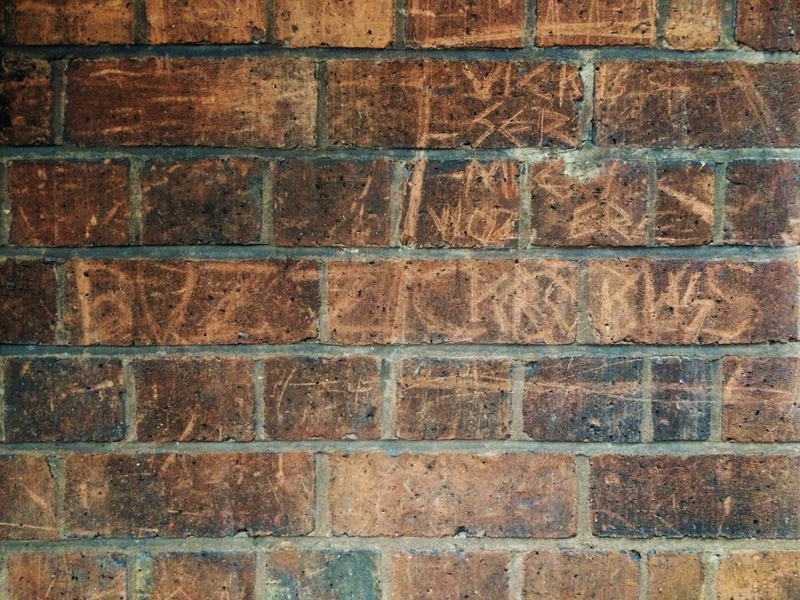 Although now subtle and faded, careful inspection reveals the names of many bands and artists who performed at the Odeon during the 1970s and 1980s. Each mark becoming clearer on inspection, some etched with care and others scrawled possibly in the heat of the moment. Of course fandom graffiti continues to this day outside of venues, but the choice of marker pen by the modern music fan makes it easy for the social reaction to be lost to a fresh wash of paint afterwards. Graffiti is often considered to be a menace but it can also be fascinating with the passage of time. There are two marks worth noting. The first is that ‘Cliff Richard’ stands out above all others, perhaps reflecting the devotion of the ‘Cliff fan’ or perhaps Cliff himself carried a hammer and chisel around? 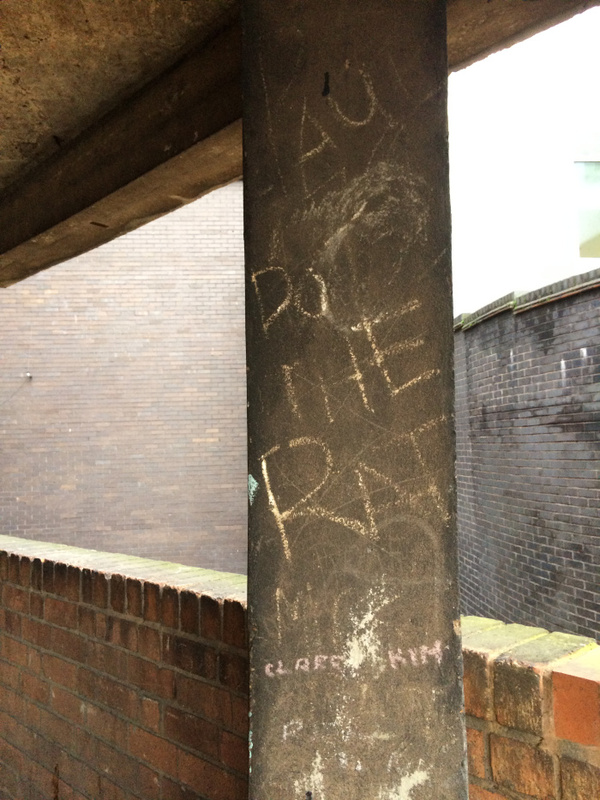 The second is the daub of white paint used in several location to declare ‘Boomtown Rats’, including a rat logo and reference to the song ‘Do The Rat’ that are both painted on a nearby concrete column. Fragile and fading marks that briefly recall an exciting and distant time in the City’s musical heritage. Perhaps you can recall making your mark or an interesting moment alongside the stage door; why not let Brumpic know! Antony is a keen observer of forgotten C20th design, artefact and place, themes reflected in his indie/ambient musical project July Skies. He tells us that his most enigmatic memory of Birmingham City Centre is from the early 1980s and the mass sight and sound of starlings coming into roost at dusk on winter Saturday afternoons, a sound loud enough to mask the street vendors cry of “Evening Mail”….you really do not witness such a fine display anymore.